Okay, so if you missed my post about my step grandmother Vadnie Harrison, you may want to go back and read that one first. Here's the link: And Then...That Was When I Felt It. Vadnie was married to a Harry Earl Sutton before she married my maternal grandfather Lemuel Harrison. 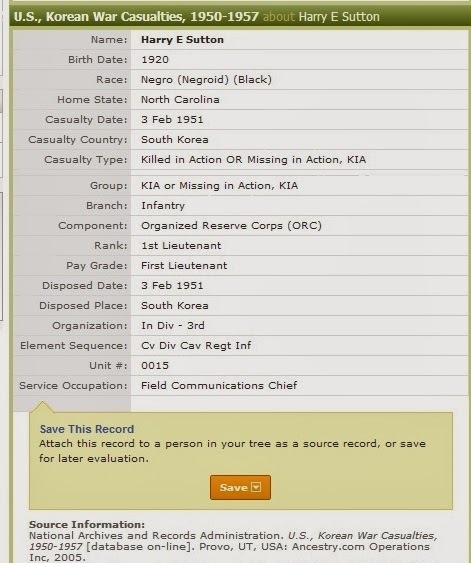 Sadly, my grandmother became a widow when Harry died in the Korean War. Let's take a look at some of the things I found on Harry. Now when I came across this I said "Say what?!" He was a 1st Lieutenant in the U.S. Army back in 1951. That's extraordinary! I realized this guy was a real hero, who paid the ultimate sacrifice for his country. I had to know more so I did some Googling. On 22 August 1950 the 555th Parachute Infantry Battalion was disbanded. 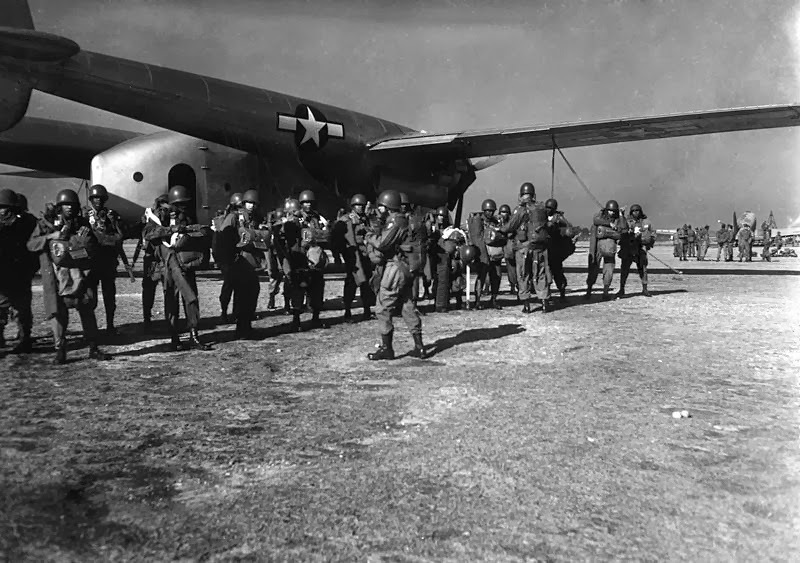 Many of its former members later fought in the Korean War, in other units. First Lieutenant Harry Sutton, one of the battalion's former officers, died leading a rearguard action during the Hungnam Evacuation and was decorated posthumously with the Silver Star. I've been all over the internet today trying to see if I would be lucky enough to find a picture of Harry, to see if my mother's description of him was somewhat accurate. She told me that he reminded her of Harry Belafonte. Well, I found a picture! Tell me what you think? Do you think my mother's description was accurate. Yes he was a cutie and a very brave man! Thanks for your kind comments. Great find in the article and picture!!!!!! Yes indeed! Thanks for stopping by. Thank you so much Cecelia! Great Piece of History that needs to be told more. This was great! We Army Folks hold the "Triple Nickel" with Great Regard! I am just amazed at the folks that I have found in my family. So much history in family history. I wish I could go back in time now and talk to my grandmother and ask her about Harry..
How sweet it would have been had Harry been asked to star in a movie mad of his life. That would be a great movie. Yes, I agree with your mother that your Harry has a similar look to Harry Belafonte. 2nd Lt. Harry Sutton has a charming smile. I think he looks better than Harry . . . I'm just saying! Wonderful find and coverage about your step-grandfather! I hope that you will be adding him to the Honor Wall in celebration of Veteran's Day Monday! Yes Liv, you're right, I think he looks better than Mr. Belafonte. I have to add his information to the Honor Wall. Thanks for the suggestion. Wow, Andrea! You’re quite lucky to have a few veterans that you can call family! And seeing how you honor your step grandmother's first husband is amazing. I wish people will come across your blog more, so they can also have a chance to get a glimpse of their own heritage, and see if they too have veterans in their lineage. I hope to read more from you. Good day! Thanks for your kind comment and for stopping by to read my blog! It's important to honor those who have come before us. 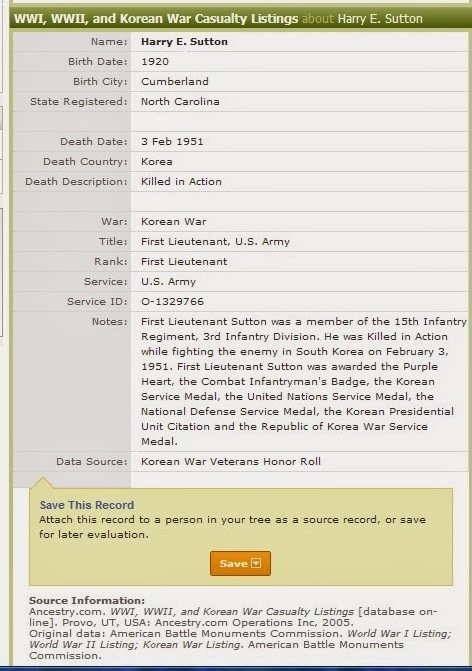 I have long been searching for any information on the Harry Sutton who was my father's bunkmate at Fort Benning, Georgia and I am wondering if your step-grandmother's first husband is this Harry Sutton. All we in my family know about Harry Sutton was that he was in Officers candidate School in Ft Benning Georgia, in 1944 and that he died in the Korean War. My father's name is William Talen and his nickname was "Bud." He was a white 19-year-old from a tiny farm town in northern Minnesota, and bunked with Harry Sutton because his name was "Talen" and thus next to "Sutton" alphabetically. The Army's Officers Candidate School had only recently been integrated to include black officers, and their specific barracks might well have been the first integrated barracks in the OCS, since even when the Army first began training black officers there the year before, originally the housing was still segregated. Having Harry Sutton as a bunkmate was life-transforming for my father, who is now about to turn 94 years old and still talks about Harry. Harry wasn't just the first black man he'd ever known; he was also the best educated and most sophisticated man of any race whom my farm-boy father had ever met. Harry was a native New Yorker from Harlem; his father was a dentist; his mother was a doctor, as Dad always recalled, and Dad's experience of seeing the racism and segregation which occurred when Harry stepped off the base, or even merely stepped out of the barracks, radicalized Dad to be a supporter of civil rights for the rest of his life. Thank you so much. I've subscribed with my current email address and also can read your response here, if that's easier. Many thanks for your postings. Thank you so much for your beautiful letter. I wish I could share more about Harry Sutton. Unfortunately, I didn't learn about him until I started researching my family history after my kids were born. I wish I could go back in time and ask my grandmother Vadnie about him. It certainly sounds like your Harry and my Harry are one in the same. I think I have a copy of a newspaper article somewhere which had a blurry picture of him. Let me see if I can find it. I believe Julie that I found a newspaper picture of Harry. He's on the left and he's not wearing a hat. Are you on Facebook? If not. I wasn't able to view your email. Mine is akellmurr72@yahoo.com. If you send me a quick note, I can reply back with that picture.